Technology on Law and Order, CSI: What do real-life cops wish they had? What Technologies on Police Shows Do Real-Life Cops Wish They Had? 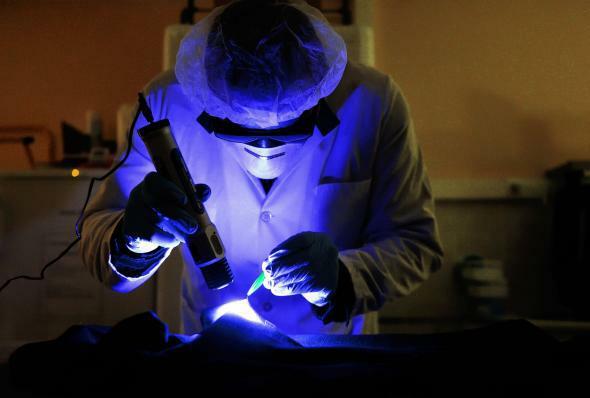 A forensic scientist uses a UV lamp to look for evidence on a garment in a French police laboratory. This could take a while, at least in the U.S. Minority Report–esque computer workstations. What we actually use are either Toughbook laptops (in patrol vehicles) or plain-Jane vanilla desktop computers. And if one is messed up, either fix it or move—IT response, at least where I worked, was glacial. Same-day forensics processing. Lab results take weeks to months, even for something as simple as verifying that suspected marijuana is, in fact, marijuana. The quick-flip DNA analysis is fantasy. Fingerprints can be done quicker in some cases, but not most other forensics. Rush requests on forensics analysis. This might be different in a gargantuan department like the NYPD, but forensics requests got shipped off to a state lab here, and as far as I know, the material going in was first in, first out. Nobody on the department had any pull with the lab to leapfrog material from other agencies. Nonstandardized patrol vehicles. I have to suppress a groan every time the CSI: Miami crew pulls up in a mint-condition Hummer H2, or when Danny is running code in a brand-new Camaro in Hawaii Five-O. In the real world, if you’re a patrol officer, you’re probably in a marked patrol vehicle with a light bar; if you’re a patrol supervisor or commander or a detective, you’re in an unmarked patrol car. Homicide divisions may have different vehicles, but they’re not going to be glitzy—they’ll range from late-model Ford Explorers up to gutted and converted Econoline vans, decommissioned ambulances, or freight truck–shaped jobs. Prescient partners. I once watched Detective Goren on Law & Order: Criminal Intent blow a case wide open, if I remember correctly, by noting accelerated molar wear on one side of the victim’s mouth, which he claimed was significant because people tend to chew on the side of their dominant hand. Or something to that effect. Horatio Caine on CSI: Miami is good for these bizarre epiphanies, too. Partners, period. In more than two years of patrol, I rode in an Adam unit (two officers to a vehicle) exactly one time. We just didn’t have staffing or budgets for it. Sheriff’s deputies had it even worse—not only did they not ride Adam, their backup was often miles away, and they routinely had to make arrests by themselves, sometimes with a car full of people. What are all the police lingo and acronyms in True Detective? What does “stop and frisk” mean as a police tactic?